My parents recently went on a cruise to Hawaii and when they asked me what souvenir I wanted, I of course answered that I needed some green Island Girl polishes from the ABC store. I have very limited experience with this brand, and I was interested in trying more. 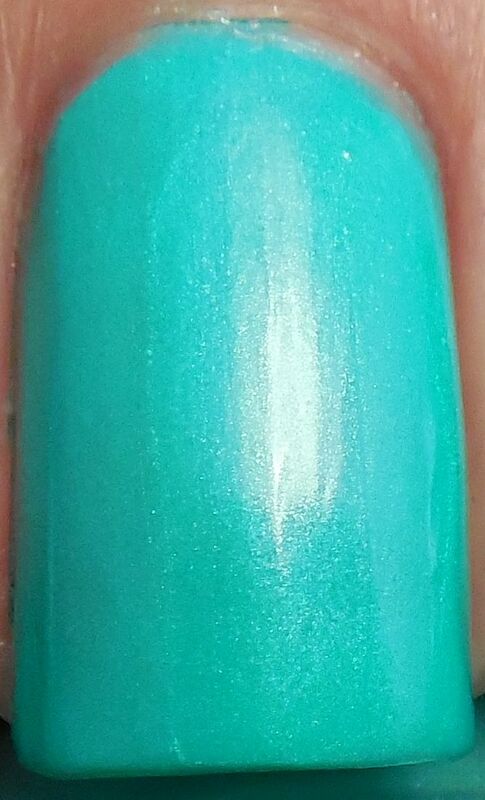 Once back from their trip, they brought me several shades of green, one of them being this pearlescent teal called Big Island Volcano. After swatching, I have to admit that the formula was very poor. It was very streaky and didn't dry as quickly as I'm used to. In this mani, I used four coats and I got some dragging on my ring finger. To top it off, there's a bubble in there too. Doh. No topcoat in these pics so you can see this natural disaster in full effect. I may or may not swatch the rest of the colors after this experience... I did notice that this brand is made by Blue Cross cosmetics which from the past has been subpar quality.